Tan Books (Charlotte, North Carolina, 2017). 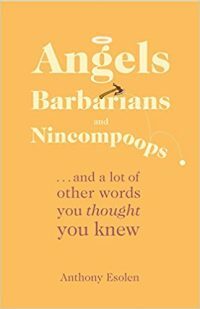 If you’re the type of person to ever wonder why the word “disgruntled” is commonplace, but calling someone “gruntled” decidedly less so, “Angels, Barbarians and Nincompoops” offers a rollicking ride through the forgotten histories of everyday words. His prior book, “Out of the Ashes: Rebuilding American Culture,” argued in part that the “cant” of modern language traps us in the empty buzzwords of a liquid, ever-changing modernity in which no truth can be pinned down and no true meaning ascertained. While this thesis is not explicitly addressed in-depth in the lighthearted “Angels, Barbarians and Nincompoops,” his rat-a-tat presentation can’t hide his deep care for and appreciation of the original meaning and historical evolution of words and their use. Esolen might be seen as pushing back against the modern tendency to see language as a free-floating vessel, rather than part of a logical system of expressing thought. Esolen, whose acclaimed translation of Dante’s “Divine Comedy” showed off his versatility in language, demonstrates familiarity with Old English, Italian, German, Latin, French and Greek in tracing how words evolve and change. Just like a front-porch conversation with a well-read, comfortably ensconced raconteur, the book can be at times delightful and interminable, and is best consumed in comfortably sized doses. Laid out with no discernable order, it’s easy to dip in and out of it “willy-nilly” (a phrase as old as Chaucer, we’re told). But does the discovery of old meanings and evolutions offer anything more than fun? Esolen believes that words can tell us about other languages, histories and modes of thinking. The project seemingly owes much of its philosophical grounding in Alasdair MacIntyre’s observation that the fragmented moral universe of today’s discourse is, at heart, rooted in the inadequacies and lack of embedded meaning in our common language. Language unmoored from its cultural and historical underpinnings can be a cause for moral confusion and talking past each other, as we use words like “justice,” “virtue” and “fairness” without understanding their original meaning. Can a better understanding of the roots, translations and histories of common and uncommon words bring us closer to the angels and further from the barbarians? Perhaps. But even if Esolen’s book doesn’t succeed in that, it will make you feel like less of a nincompoop. Brown is a graduate student at Princeton University’s Woodrow Wilson School of Public and International Affairs.